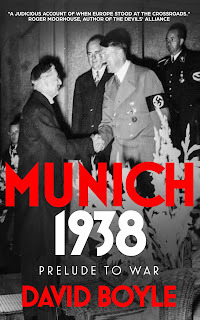 Third and finally, because of the article I wrote for the Guardian today, where I compared Munich with the Salzburg summit, and – by implication – Chamberlain with Theresa May. It was one of those pieces where the arguments flew around in the comments ‘below the line’. It is worth reading that section alone for a cross-section of views – worrying perhaps that Chamberlain gets rather more sympathy than I believe he should. David, you should have mentioned my mother's ( Shiela Grant Duff's )book Europe and the Czechs which she wrote as Penguin Special and issued to all MPS ( in lieu of her royalties) in a desperate attempt to stop the Munich agreement and that she had been writing in other papers and above all in touch with Churchill to help her support the Czechs. She was devastated by the Agreement. Since you mentioned her this was the most important aspect of her work. I am really sorry that I did not make more effort to get republished her 1982 book about all this - The Parting of Ways . Perhaps still not too late. Have you any dealings with Penquin ? I don't know how to publish tghis to you as none of the suggestions they put are current. If necessary I'll have to put the gmail address but I never use it.